Please note that we are told by Chazal to permute the letters in each line of the *42*-Letter Name and there are exactly 620 different permutations with the 6 letters in each line, yet another obvious connection to *keter*. In the 18th generation of Adam, *Terach* (TRCh) was born and value of his name plus the kolel of 3 for the 3 letters is 611, the same as “Torah. Now *Terach* was an idol worshiper, just like Yitro, whose name also has the value of 611. Terach was also Abraham’s father and Yitro Moses’ father-in-law. Another son of Terach also became the father of Sarah, grandfather of Rebecca and great-grandfather of Rachel and Leah, not to mention Ruth which led to King David. Terach (TRCh) and his 3 sons, (Abram) EBRM, (Haran) HRN and (Nachor) NChVR all had the letter Resh (R) in their names (as in Ruth) and collectively there are 14 letters in their 4 names as in the value (14) of the name David, but when we take the Alef of Abram and add is to the name of Haran, mimicking the male-female exchange of seed/energy/mochin from Abraham and his defendants and Haran and his descendants and we get Aaron (EHRN), who we know to be connected to H’Mashiach (the Messiah) and whose name is the only one mentioned in the Torah in conjunction with H’Mashiach. The 4 names sum to 2577, which may or may not allude to the year 5778, the year prophesied for the arrival of H’Mashiach as explained in The Divine Calendar. Abraham (still Abram at the time) was told to leave the land of this father and journey to the land G-d would show him. This occurred in the 42nd paragraph of the Torah (Genesis 12:1). When the connotes divine movement, as in the 42 journey of the Israelites, it usually does so with the paired prefixes, From and To (mem and bet, together, 42) and it did so here as well. 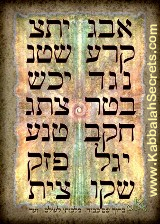 Journeying from Ur Casim* (M‘EVR CShDYM) which totals 621 or 620 plus the kolel of 1. The traveled toward Canaan (CNAN) whose value is 210, a hint of the 210 years of exile the Israelites would go through in Egypt once they left Canaan. They came as far as Charan and Terach died in Charan (BChRN), completing the mem-bet combination and giving the last word before the 42nd paragraph in the Torah the value of 910, plus 1 for the kolel, makes 911, the same as “Beginning” or without using the sofit gematria, simply the value 260 or 10 x the value of the Tetragrammaton (YHVH), 26.